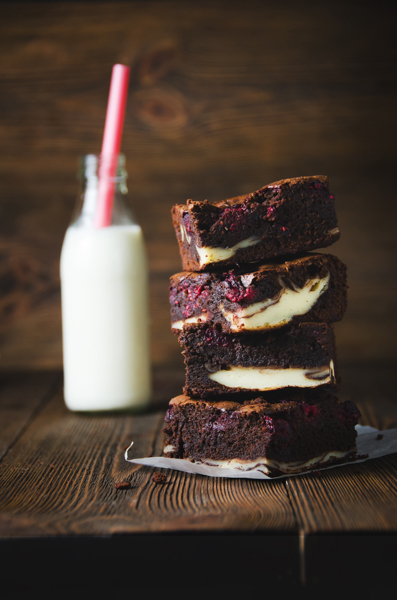 Raspberries, chocolate, cheesecake and brownie are some of the best things in life, so why not put them all together for a decadent winter treat? Preheat the oven to 180°C. Lightly grease a 9×13-inch baking pan. Brownie batter: In a large saucepan, melt the butter, then stir in the sugar, cooking until the mixture is smooth and shiny. Remove from the heat and stir in the cocoa, salt, baking powder, powdered coffee powder and vanilla. Allow to cool for about five minutes. Whisk in the eggs, then the flour, stirring until smooth. Cream cheese batter: Beat the room temperature cream cheese until it is completely smooth and there are no lumps. Mix in the sugar and flour, then the vanilla, cream and eggs. Next fold the chocolate chips into the brownie batter and spoon half the brownie batter into the prepared pan. Add the cream cheese batter to the top of the brownie batter. Whip up the raspberry coulis by placing raspberries, caster sugar and a squeeze of lemon juice (no more than 1 tsp) into a bowl and beating with a hand blender. Place the coulis on top of the cream cheese batter, then add the remaining brownie batter onto the cream cheese, swirling these together. Bake the brownies for 35 to 45 minutes, until a toothpick or knife inserted into the centre comes out clean and the edges are set. Remove the tray from the oven and loosen the edges with a knife. Cool completely before cutting. Can be frozen and added to the lunchbox as needed. Freezing this decadent slice may, after all, be the only way it will last more than one meal!